Samsung Electronics Vice Chairman Lee Jae-yong met Microsoft CEO Satya Nadella in Seoul to discuss ways to strengthen cooperation in areas including artificial intelligence and cloud-computing technology, according to industry sources Wednesday. During the meeting, the two agreed to expand their partnership in technologies critical to future growth, including AI, cloud-computing services, data-center operations, 5G networks and software development, Samsung Electronics said. 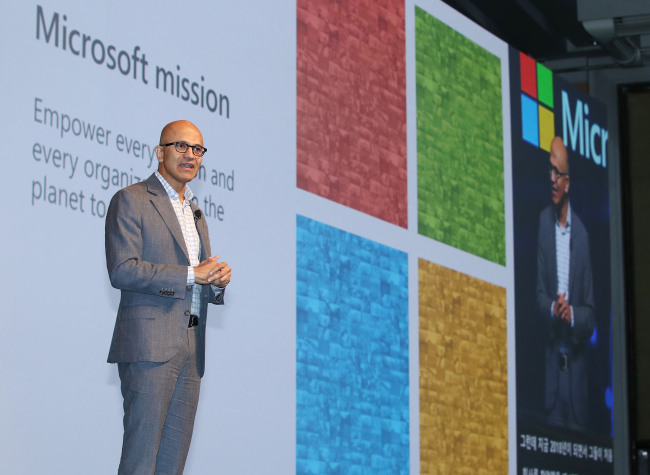 Microsoft Korea declined to comment on the meeting, including its content and purpose. The extended partnership will likely be centered on cloud services, considering Microsoft’s “Mobile First, Cloud First” strategy. It also suggests a potential increase in cloud-related supply contracts between the two companies, said an industry source who declined to be named. “Given that high-density memory chips and SSDs are integral to delivering optimal cloud services, Samsung’s supply of semiconductors for cloud servers to Microsoft is expected to increase. Samsung’s products will also employ more of Microsoft’s cloud services,” the source said. Microsoft and Samsung are already working together in the cloud business. During his keynote speech at Wednesday’s conference, Nadella cited Samsung’s smart air conditioners as an example of how Microsoft’s intelligent cloud platform Azure is being used to collect and analyze data, enabling products to run on internet of things technology. In Korea for the first time since assuming his post in 2014, the Microsoft CEO called on companies and organizations here to aggressively pursue digital transformation to stay competitive in a world where computing is becoming ubiquitous. He said Korean firms should embrace “tech intensity” -- the ability to quickly adopt the latest technologies while building digital capabilities of their own -- and stressed Microsoft’s readiness to assist clients in doing so. “It’s all about your technology and your tech intensity. We want to build technology so that you can go on to build on more technology. It’s as simple as that,” Nadella said, touching down on the company’s founding mission -- to empower firms to do more with technology. As part of such efforts, Microsoft is building Azure -- its intelligent cloud-computing platform -- as the “world’s first computer.” With data centers in 54 global regions, including two in Korea, the US software giant is “building tremendous capability worldwide” so that applications can be started and deployed anywhere, said the chief. With the massive computing infrastructure and resources at its disposal, Microsoft is also advancing its artificial intelligence capabilities, achieving milestones such as being the first to achieve human parity in AI-powered machine translation. And such AI capabilities have been made available to clients through Azure. “We are making these (AI) technologies available as a set of services that can be extended, so that everyone can incorporate them as applications. That’s what Azure AI does: the best vision, speech-language processing capacities and also fantastic computing structure so that you have the capability to build your own AI,” he said. Many Korean companies are already doing this, using Microsoft’s solutions. In addition to Samsung Electronics, Korea’s game company Pearl Abyss -- behind the hit game “Black Desert” -- uses Azure to service its games and collect the metadata needed to improve the game’s operations. 356MC is using Azure’s machine-learning solutions to develop AI systems to assist surgeries, while CarDoc uses Azure AI to automatically detect damage to a vehicle by analyzing images. Meanwhile, KAIST is building predictive power to assess traffic conditions and prevent road accidents using Azure. The Microsoft chief also stressed the importance of cybersecurity, privacy and ethics in building AI systems, saying not just “what computers can do, but also what computers should do” were important considerations in AI development.